Why does my cat always sit on me? You’re all settled in on the couch, when suddenly, kitty jumps into your lap to snuggle. It’s one of the best things about being a pet parent, but why does your cat like to sit on you so much? Cats have a much higher base temperature than humans. A healthy cat’s body temperature falls somewhere between 100 and 102 degrees. They purposely seek out warm spots so their bodies don’t have to work as hard to keep their temperature up. And it turns out, your lap is one of those warm spots! Just like humans, cats feel more secure if they are close to someone else. If you’re a cat, you just can’t get any closer to someone than sitting on top of them. Sitting on you or sitting next to you, their idea of a giant friendly cat, helps them to believe that you’ll scare any predators away. Ever notice your cat sits on your lap right when you’re in the middle of reading a book or working on your laptop? That’s no coincidence! Your cat wants your attention, and he knows to settle right where you’re focused. Unfortunately, if you pet them, you’re likely reinforcing the behavior. Just like people, some cats are friendlier than others. Temperament, personality, or even breed can influence how cuddly and social a cat is. Your cat may just be naturally drawn to people and like to have more bonding time. You may have guessed it, but snuggling up is just one of the many ways that cats show their love and affection. This is especially true if you’ve been at work all day and they’ve been alone. Remember, there are lots of warm places to sit, but they chose you, after all! 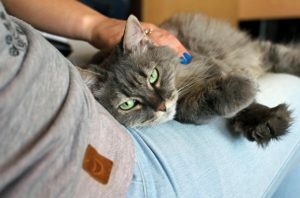 Looking for someone to spend time with your lap cat over the holidays? Contact us to set up an appointment with one of our friendly sitters! Can you give your cat a cold?